No matter where you’re going, a good set of luggage will make your trip much easier. Whether you’re looking for a set for your family or the best 2 piece luggage set, you’ve come to the right place. We researched some of the best-seller and top name brands and put together this buying guide to help you find the best set for you. Before we get to it, let’s look at some of the key features you need to know about. Type: We found both hard and soft sets that were pretty awesome as we did our research. Each type has its pros and cons and it’s really up to you which one you prefer. Pieces: We found sets that range from 2 to 4 pieces. We even found one suitcase that was so great on its own that we included it just in case anyone is looking for one really awesome bag. Color Options: Color options vary. Some of these only come in 1 while others offer up to 17 different options. You’ll find bright colors, plain colors, neon colors, and even animal prints so there’s really something for everyone. Wheels: Wheels are kind of essential so it’s a good thing all of these top picks have them. The quality and number of wheels vary slightly and some are more high-tech than others. But, they’ll all get the job done. Retractable Handles: All of the sets we chose have retractable handles. They make it really easy to pull your luggage along at the airport without taking up too much room during travel. Some even have 2 stop handles for added convenience. Warranty: Warranties vary from 1 to 10 years but the length that shows up the most is 5 years. As always, know what’s covered under your warranty as well as what isn’t. It’s always good to know before you need to use it. Now that you know a little more about what to look for, let’s get into our luggage set buying guide. If you’re in a hurry, start with our top and budget pick. They’re right at the top of our list and will give you a good idea of the range that’s available. Keep reading about all of our other products if you can, each one is unique in its own way. Alright, are you ready? Let’s take off into our reviews. Our top pick is one of the best quality luggage sets around, the Caribbean Joe Castaway Set. This is a 4 piece set that includes a tote, carry-on, medium, and large suitcase. The carry-on manufacturer rigorously tests to make sure that it will fit into the overhead compartment of most airlines. 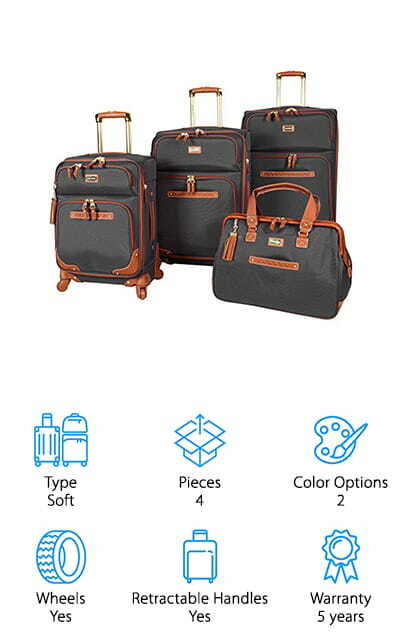 This set is made of soft, cross woven polyester fabric with an accent trim that looks sharp and will help you identify your luggage quickly when waiting at the baggage claim. Moving through the airport is easy, too, thanks to the telescopic handle and 360 degree spinner wheels. There are actually 8 spinner wheels instead of 4 for more control. Each case in this set expands 2 inches for extra capacity and has a fully lined interior has pockets so you can keep everything organized. The Rockland Luggage set is one of the best inexpensive luggage sets available. It’s made of heavy duty hi-count fabric for extra durability and is packed with features that make this a great set for heavy travelers. 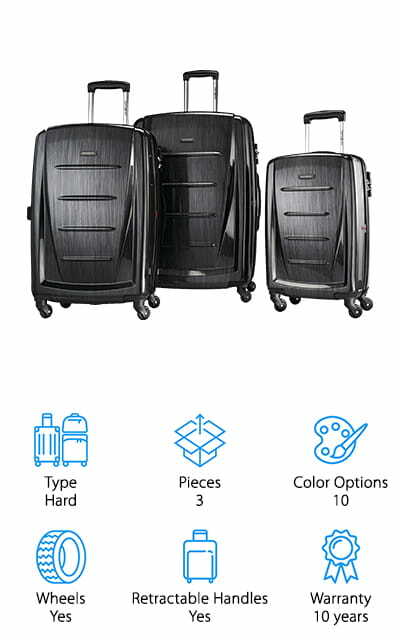 The upright suitcase comes with EZ-Roll wheels to maneuver easily through the airport. There are stability bars in the bottom to avoid tilting. There are also 2 front zippered pockets to secure smaller items while keeping them accessible. There are internal organizational pockets, too. The carry-on has an adjustable and removable non-slip strap and full interior lining. It meets the size requirements for most airlines carry-on policies. 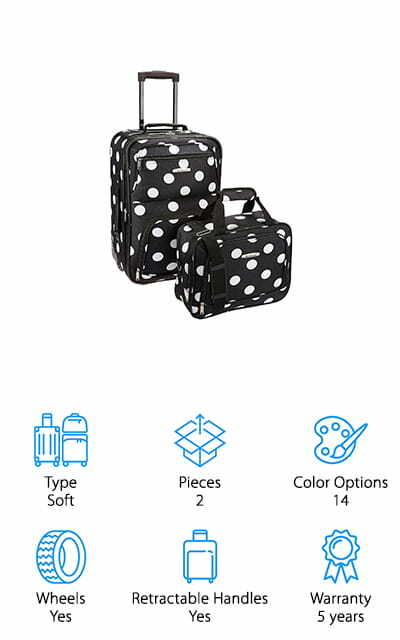 Another awesome thing about this best two piece luggage set is there are so many designs to choose from. There are 14 total, ranging from polka dots to solids to animal prints. If you’re looking for the best hard luggage set, check out the Delsey Helium Aero Trolley. It’s made of 100% polycarbonate and is extremely resistant to cracking and breaking and very lightweight. The deep metallic finish is really stylish and is available in 8 different colors. Inside, it features 2 large compartments that are fully lined and multiple pockets to keep everything organized during travel. Plus, it expands 2 inches if you need some additional room. There are web straps and a zippered divider that help you secure your belongings, too. Double spinner wheels give this case exceptional maneuverability and multi-directional rolling. That’s not all, it even has a handle system that has 2 different lock positions. This carry-on sized suitcase is equipped with a TSA accepted lock so you get through security as fast as possible. 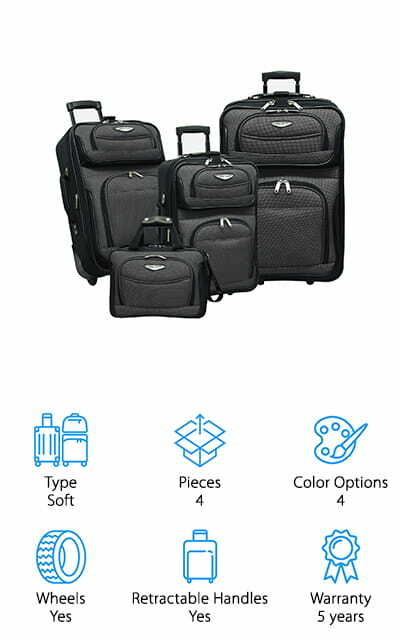 Our next choice for the best luggage set for sale is the Samsonite Winfield Luggage Set. This 3 piece set is made of 100% polycarbonate. It’s lightweight, has sharp molded details, and a really awesome looking brushed finish. Not only does the finish give this bag a lot of style, it also helps cover any scratches or scuffs that happen during travel. This case was designed to flex under stress and then return to its original shape. That means your belongings stay protected and you don’t have to worry about dings and dents. The side combination lock is TSA approved and will help you get through security as quickly as possible. Inside, the fully lined interior has cross-straps, a privacy curtain, and zippered organizational pockets. It’s available in 8 different deeply saturated gorgeous colors. 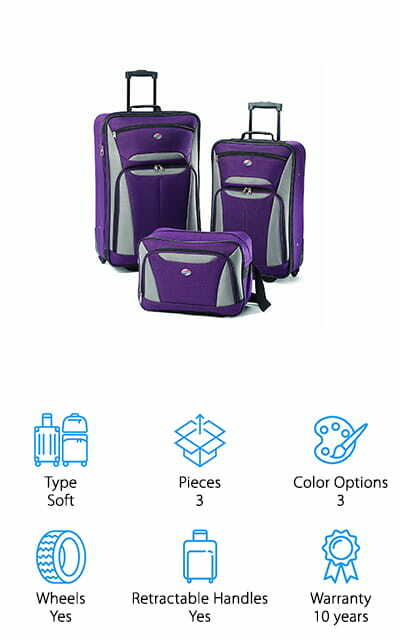 The American Tourister Fieldbrook II Set is the best travel luggage set for everyone who prefers soft sided luggage. This set includes a boarding bag, 22-inch upright, and a 25-inch upright. The ultra-lightweight construction and inline skate wheels are really easy to maneuver. The upright bags each have 4 wheels with ball bearings. This minimizes the friction and makes for a really smooth ride. Reinforced corners help add strength to protect the material from the harsh conditions of frequent travel. There are multiple pockets on both the inside and outside that help you keep your things organized. The tote is the perfect sized carry-on and has a zippered pocket where you can keep all your important travel documents safe but close by. The best lightweight luggage set is from Steve Madden which is ideal because it can help you save some money on airline baggage fees. 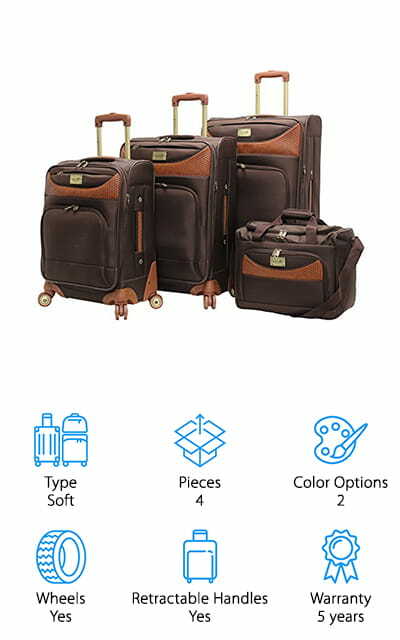 This is a 4-piece set with a 20, 24, and 28 inch upright and a carry-on bag. They’re made of durable brushed dark grey nylon fabric with tan leather accents and trim. These pieces are easy to take through the airport. Each is equipped with a 360 degree wheel system and ergonomic handles so you can move fast and stay comfortable. These suitcases will also stay upright and are balanced really well. That’s not all, the interiors are lined and have several organizational pockets for efficient packing. As for storage, don’t worry. All 4 of these bags can be nested inside one another so it’s easy to tuck them away. Traveler’s Choice Amsterdam Set is easily the best value luggage set we found. It’s a 4 seat set that’s extraordinarily affordable. It includes a large, medium, and small upright suitcase and a carry-on tote. The material is 2-tone polyester with PVC backing for extra durability. Each of the uprights has a retractable push-button handle as well as top and side carry handles. You can also expand them to fit in even more of your belongings. The inline wheels help roll them effortlessly through the airport to your next destination. The tote is the right size for a carry-on. It has a front zipper pocket where you can keep important travel documents and an adjustable, detachable non-slip padded shoulder strap. This set is available in a few colors, too: burgundy, black, navy, and orange. 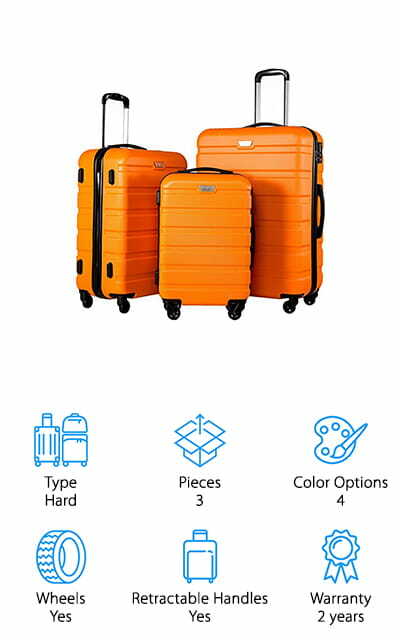 When it comes to the best rated luggage sets, you can’t go wrong with this one from Coolife. This set consists of 3 different uprights, measuring 20, 24, and 28 inches. The smallest one can even be used as a carry-on with most airlines. They can nest inside each other for storage, too, which is a huge space saver. Each one is equipped with spinner wheels that rotate 360 degrees and have multidirectional movement. The telescoping handles are made of aluminum and very sturdy. They’re equipped with 3-digit combination locks, too, so you don’t have to worry about anything being stolen. The interiors are fully lined and have both a privacy curtain and zippered organizational pockets. And get this: if you want to upgrade and get a 16-inch bag, there’s a family set available as well. Last up in our best luggage set review is the Goplus 3 Pcs Luggage Set. It’s made of polycarbonate and ABS which gives you a durable, lighter shell. The surface is textured to protect it from scratches and scuffs and it makes it really easy to clean after a long trip. This set has a very plain, simple design. It comes in 10 different colors, some of them are quite bright and make a bold statement so it’s far from boring! 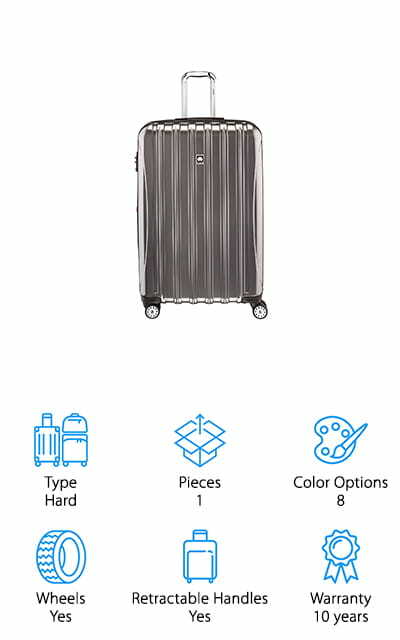 Each suitcase has 4 multi-directional. 360 degree wheels to help you quickly and smoothly roll through the airport. Inside, you’ll find a fully-lined interior and zippered pocket to organize your things. The push-button, telescoping handles are ergonomically designed for easy transport. One more thing, it includes a built-in firm coded lock for safety and security. 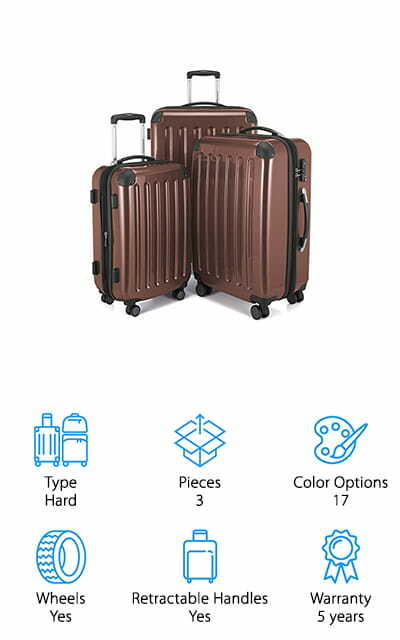 If you want a great set of hard luggage, the best 3 piece luggage set is the HAUPTSTADTKOFFER Luggages Set. One of the best things about this set is that they can be stored nested inside one another. As far as travel goes, they have a lot of great features. They’re made of polycarbonate so they’re more durable and will last longer than other sets. 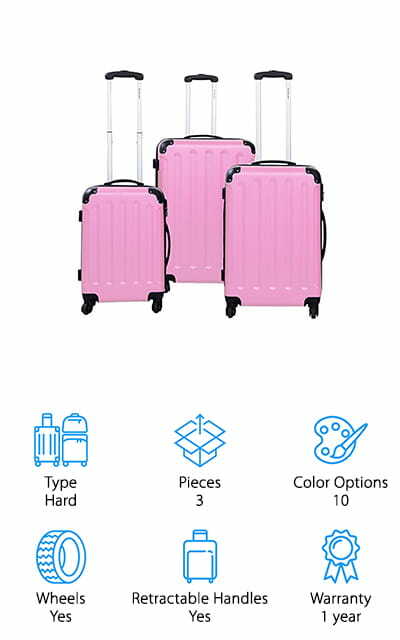 Each suitcase in this set has 4 multi-directional wheels that glide smoothly and solidly around the airport. It also has a TSA combination lock that has a resettable code to make it a little easier to get through security quickly. There are a lot of color options with this set, too. You can choose from 17 different shades that range from light and dark neutrals to very bright and even camouflage.